Location: Cowes, Isle of Wight, England. Ownership / Access: Royal Yacht Squadron. Not open to public. Notes: Cowes Castle, also known as West Cowes Castle, is a Device Fort in Cowes on the Isle of Wight. Originally built by Henry VIII in 1539 to protect England against the threat of invasion from France and the Holy Roman Empire, it comprised a circular bastion, flanking wings and a keep, and in 1547 it housed 17 pieces of artillery. With its companion fortification at East Cowes, the castle overlooked the entrance to the River Medina, an important anchorage. The invasion threat passed but the fortification continued in use until the middle of the 19th century, very briefly seeing action in 1642 during the English Civil War. Decommissioned in 1854, the castle was first leased, and later bought outright, by the Royal Yacht Squadron to form their new clubhouse. The Squadron then employed the architect Anthony Salvin to rebuild large parts of it between 1856 and 1858. 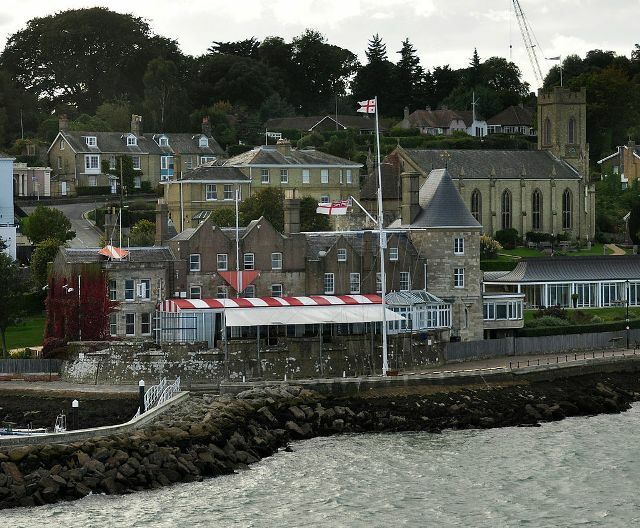 It became the headquarters for part of the D-Day invasion force during the Second World War, but has otherwise remained in use by the Squadron and is a distinctive landmark in yacht races along the Isle of Wight.